Cheltenham’s 2000Trees Festival returns in 2019, bringing with it a selection of rock, alternative, and metal music’s finest acts. 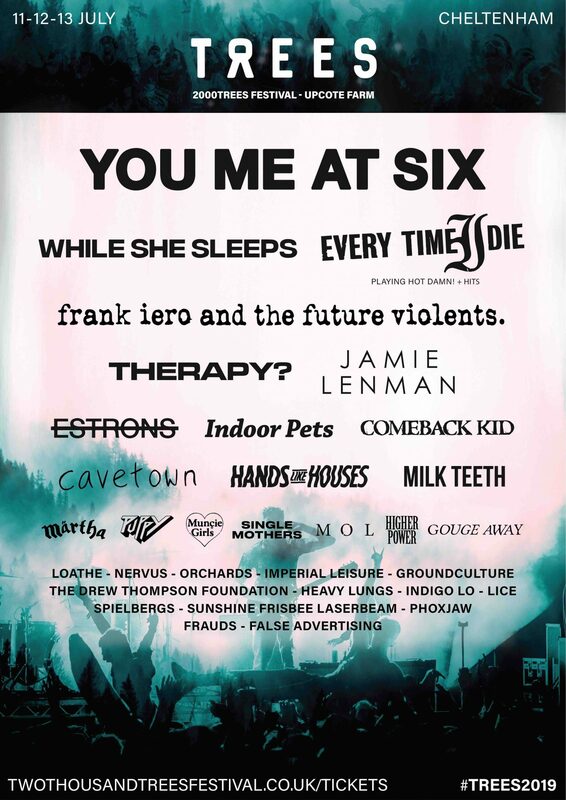 Taking place at Upcote Farm in the Gloucestershire countryside from July 11th – 13th, the festival will be headlined by the inimitable You Me at Six. The killer line-up doesn’t stop there, however, as over 30 bands have been confirmed for the two-dayer, from some of alternative rock’s biggest names, through to emerging acts who are just setting out in their idols’ footsteps. Also included in the line-up are: Sheffield metalcore band, While She Sleeps; Every Time I Die, who will be performing Hot Damn! and various other hits; Northern Irirsh alt-rockers, Therapy?, who will hopefully be rolling Screamager out for an airing; and frank iero and the future violents, who were announced as Iero‘s new band at the back end of 2018. Ticketholders can also enjoy performances from Jamie Lenman, Estrons, Indoor Pets, Comeback Kid, Cavetown, Hands Like Houses, Milk Teeth, Martha, Puppy, Muncie Girls, Single Mothers, MOL, Higher Power, and Gouge Away. If you are a fan of alternative metal and rock, then 2000Trees is almost certainly the festival for you. With 12 years of experience under their belt, they have consistently improved, year-upon-year. 2019 looks set to be their best festival yet. Artists: You Me at Six, While She Sleeps, Every Time I Die, frank iero and the future violents, and more. Prices listed on 13/1/19 and are subject to change closer to the event.